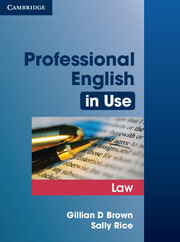 Professional English in Use Law is suitable for upper-intermediate to advanced students and contains 45 units covering a wide variety of legal vocabulary. Topics include corporate and commercial law, liability, contract law and intellectual property. The book also introduces general legal vocabulary related to legal systems, the legal professions and the skills lawyers need in their daily working lives. Professional English in Use Law is also an ideal companion for learners preparing for the new Cambridge International Legal English Certificate (ILEC) and covers key topics and vocabulary from the exam. Covers a wide variety of legal vocabulary that gives learners the confidence and ability to function in English in a legal environment. 'Over to you' activities allow learners to apply the vocabulary they learn to their own law studies and working lives. Language is presented and explained on the left hand page, and then practised on the right hand page. A full index with pronunciation shown in IPA allows students to look up words they don't know and see where in the book the word appears. 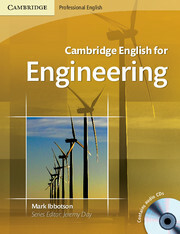 Covering key ILEC vocabulary and topics, this book is the ideal companion for students preparing for the Cambridge ILEC exam.